The aim of this study was to assess the role of triphasic computed tomography to predict tumor necrosis of hepatocellular carcinoma (HCC) after transarterial chemoembolization (TACE). Triphasic computed tomography is a promising tool in prediction of HCC response after TACE. HCC exhibiting favorable criteria in triphasic computed tomography would be more likely to benefit from TACE. For HCC without these favorable criteria, alternative or adjuvant treatments or even no treatment may be considered. These favorable criteria are small size, solitary, well-defined margin, peripherally located, and typically enhanced HCC tumors. A total of 50 patients were included in the study. All patients underwent complete history taking, clinical examination, laboratory investigations, and then triphasic computed tomography examination of the liver as a baseline assessment. Thereafter, the patients were treated with TACE. Finally, the therapeutic response was evaluated after 21 days by triphasic computed tomography scan of liver according to modified response evaluation criteria in solid tumors. Of the 50 patients, 23 showed complete necrosis, 22 showed partial necrosis, four were stable, and one showed progressive disease. Tumor size, its enhancement, and number were statistically highly significant, with a P value of less than 0.001. Location and margin of the tumor were statistically significant, with P value of 0.04. Triphasic computed tomography is the most commonly used standard imaging technique for predicting and evaluating the therapeutic response in patients with HCC after TACE. Among primary liver cancers, hepatocellular carcinoma (HCC) represents the major histological subtype, accounting for 70–85% of the total liver cancer burden worldwide. However, most HCCs in patients are unresectable at diagnosis because of multicentricity, large tumor size, or a poor hepatic functional reserve owing to preexisting cirrhosis, or they are not transplantable because of an advanced tumor stage or severe comorbidity . Major risk factors for HCC include infection with hepatitis B virus (HBV) or hepatitis C virus (HCV), alcoholic liver disease, and most probably nonalcoholic fatty liver disease. Less common causes include hereditary hemochromatosis, α1-antitrypsin deficiency, autoimmune hepatitis, porphyrias, and Wilson's disease. The distribution of these risk factors among patients with HCC is highly variable and is dependent on geographic region and race or ethnic group . There are several potentially curative or palliative approaches to the treatment of HCC. Numerous staging systems for HCC have been developed, and they have been validated to varying degrees. Barcelona Clinic Liver Cancer staging has been proposed as the standard means of assessing the prognosis of patients with HCC . Transarterial chemoembolization (TACE) seems to be an important treatment strategy. TACE is the current standard of care for patients presenting with multinodular HCC and relatively preserved liver function, absence of cancer-related symptoms, and no evidence of vascular invasion or extrahepatic spread . TACE was described first in 1977 and involves the transarterial administration of chemotherapy in combination with embolization. Embolization limits vascular washout of chemotherapy. In addition, the subsequent hypoxic injury is likely to inhibit the tumor cells' ability to clear intracellular chemotherapy. This technique allows for much higher levels of local chemotherapy compared with systemic dosing with decreased systemic exposure . 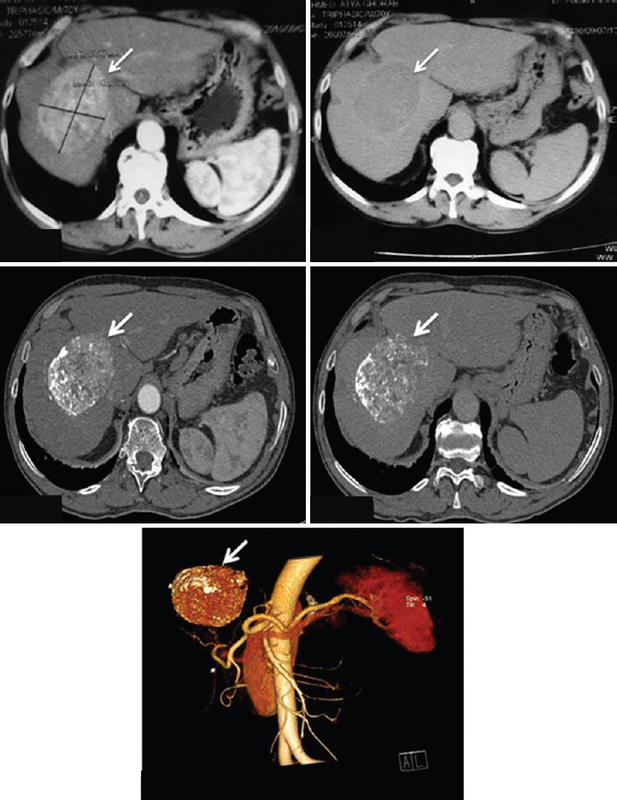 Key predictors of the computed tomography (CT) of tumor response after chemoembolization on unresectable HCC include the tumor's size, vascularity, and number, and portal vein invasion. Factors associated with poor prognosis for overall patient survival include Child–Pugh class B or C, tumor size of at least 4 cm, five or more tumors, portal vein invasion, and α-fetoprotein (AFP) level more than 83 ng/ml . Follow-up CT scans are obtained ∼10–14 days after chemoembolization. An early scan may be acquired if complications, such as nontarget embolization, are suspected. Because the chemotherapeutic agent is mixed with lipiodol, CT scans of a tumor reveal dense opacification associated with necrosis. In patients with HCC, if the embolization procedure is successful, the postprocedural CT scan will show a lipiodol uptake of greater than 50% in necrotic tumor. In these cases, the embolization is repeated in 6–8 weeks . 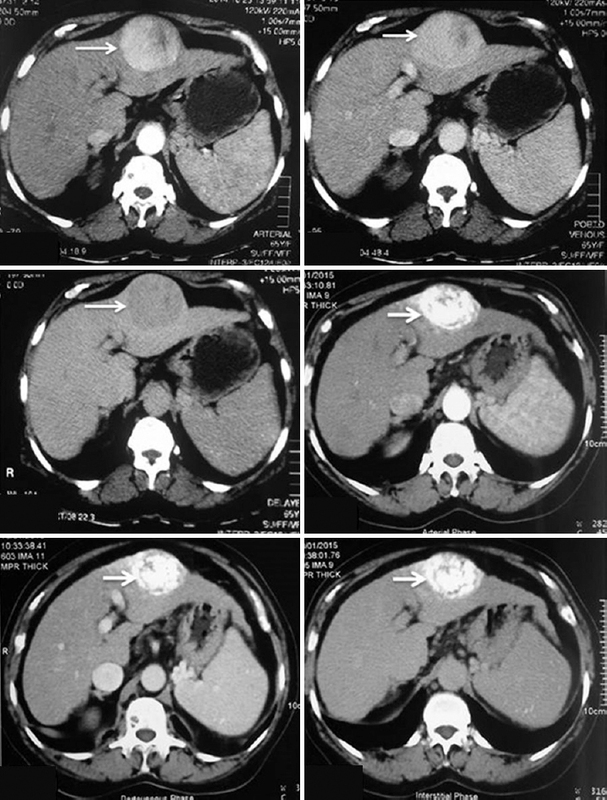 The aim of this work is to assess the role of CT to predict tumor necrosis of HCC after chemoembolization. A total of 50 patients diagnosed as having HCC were included in this study. This study was prospective and performed between November 2013 and November 2015. The study was approved by Ethical Committee of Menoufia Faculty of Medicine, and informed consent was taken from each patient. The patients were submitted for the study and reviewed against inclusion and exclusion criteria as follows. Inclusion criteria include patients diagnosed as having HCC by typical features of HCC based on triphasic CT and elevated serum level of AFP more than 200 ng/dl, having unresectable HCC (<3 to >10 cm in maximum diameter and not >3 in number), having Child–Pugh A and B scores, who refused the surgery or were not suitable for resection, and having serum creatinine level less than 1.4 mg/dl. Exclusion criteria include advanced liver disease, advanced tumoral disease, any contraindications for using chemoembolizing drugs, any contraindication for hepatic embolization procedures, patients with allergy to the contrast media, pregnant patients, and patients with HCC tumors who had previously been treated with another locoregional therapy. All patients were subjected to the following: history taking and clinical examination, laboratory studies, imaging studies with abdominal triphasic spiral CT technique, liver function tests, coagulation profile, AFP level, complete blood picture, and renal function tests. Finally, the patients underwent triphasic CT. The equipment used in the examination was a 20-channel multidetector CT scanner (Siemens 20 Somatom Definition AS 2010, Siemens Healthcare, Nederland BV, PO Box 16068, 2500 BB The Hague) at the National Liver Institute. We made sure that the radiologists were present at the time of the examination. We also made sure that only professionally trained CT technicians performed the examinations. All data were collected, tabulated, and statistically analyzed using SPSS 19.0 for Windows (SPSS Inc., Chicago, Illinois, USA). Two types of statistics were done. Qualitative data were presented as frequencies and percentages. χ2-Test and Fisher exact test were used to measure association between qualitative variables. The significance level was set at P 0.05 or less. A total of 50 patients from both sexes with different age groups, with HBV or HCV, with Child–Pugh class A or B [Table 1], and with HCC presenting to the National Liver Institute were examined in this study to evaluate the response outcome of the studied patient group. Regarding the response outcome of the studied 50 patients, we found that 23 (46%) patients showed complete response (CR), 22 (44%) patients showed partial response (PR), four (8%) patients showed stable disease, and one (2%) patient showed progressive disease (PD) [Figure 1] and [Figure 2]. Figure 1: Response outcome of the studied patients. Figure 2: Relation between response and location of lesions. We first analyzed the relation between tumor size and response according to modified response evaluation criteria in solid tumors (mRECIST). Of the 23 (46%) lesions that showed CR, the size was less than 3 cm in 17 (73.9%) lesions, from 3 to 5 cm in five (21.7%) lesions, and from 5–10 cm in one (4.3%) lesion, with no lesions more than 10 cm. Of the 22 (44%) lesions that showed PR, the size was less than 3 cm in eight (36.3%) lesions, from 3 to 5 cm in nine (40.9%) lesions, and from 5–10 cm in five (22.7%) lesions, with no lesions were more than 10 cm. Of the four (8%) lesions that showed stable disease, their sizes were less than 3 cm in two (50%) lesions, from 3 to 5 cm in one (25%) lesions, and from 5 to 10 cm in one (25%) lesion, with no lesions more than 10 cm. The only one (2%) lesion that showed PD had size more than 10 cm [Table 2]. We also examined the relation between response and location of lesions. We found that of 23 (46%) lesions that showed CR, the location was peripheral in 18 (78.3%) lesions, central in three (13%) lesions, and mixed in two (8.7%) lesions. Of 22 (44%) lesions that showed PR, the location was peripheral in 12 (54.4%) lesions, central in 10 (45.5%) lesions, and no lesions (0.0%) were mixed. Of four (8%) lesions that showed stable disease, the location was peripheral in two (50%) lesions and central in two (50%) lesions. The only one (2%) lesion that showed PD had central location [Figure 3]. Figure 3: Response to transarterial chemoembolization in relation to margin of lesion. We examined the relation between response and enhancement of lesions. 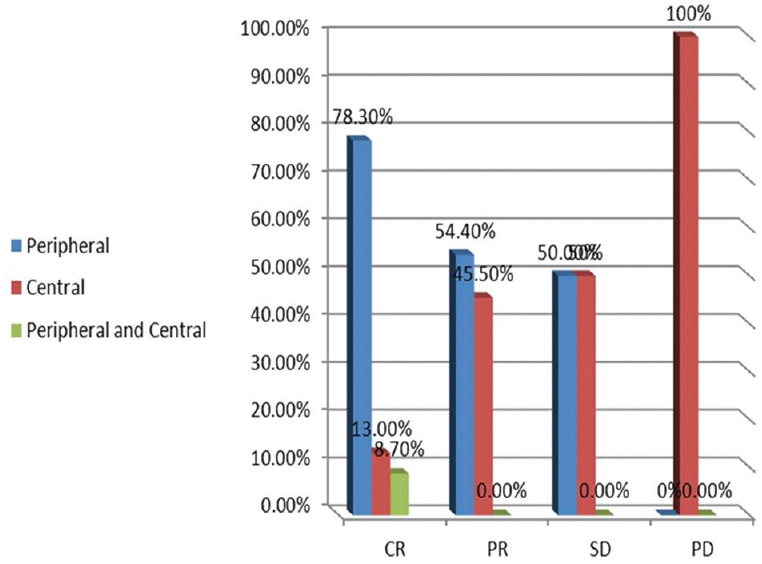 Of 23 (46%) that showed CR, the enhancement pattern was typical in 19 (82.6%) lesions and atypical in four (17.39%) lesions. Of 22 (44%) lesions that showed PR, the enhancement pattern was typical in 16 (72.72%) lesions and atypical in six (27.27%) lesions. Of four (8%) lesions that showed stable disease, the enhancement pattern was typical in four (100%) lesions, and no lesions were atypical. The only one (2%) lesions that showed PD had typical enhancement pattern [Table 2]. We examined the relation between response and margin of lesion. Of 23 (46%) lesions that showed CR, the margin was well defined in 20 (46.5%) lesions and ill-defined in three (42.9%) lesions. Of 22 (44%) lesions that showed PR, the margin was well defined in 19 (44.2%) lesions and ill-defined in three (42.9%) lesions. Of four (8%) lesions that showed stable disease, the margin was well defined in four (9.3%) lesions, and no lesions were ill-defined. The only one (2%) that showed PD was ill-defined [Table 3]. Preembolization triphasic CT findings, axial scans, and arterial [Figure 4]a, portal [Figure 4]b, and delayed [Figure 4]c phases showed left-lobe (segment II) well-defined solitary exophytic typically enhanced mass measuring 5 cm in diameter (thin arrow). The mass shows heterogeneous enhancement. No enlarged porta hepatis lymph nodes were observed. The portal vein was patent (arrowhead). 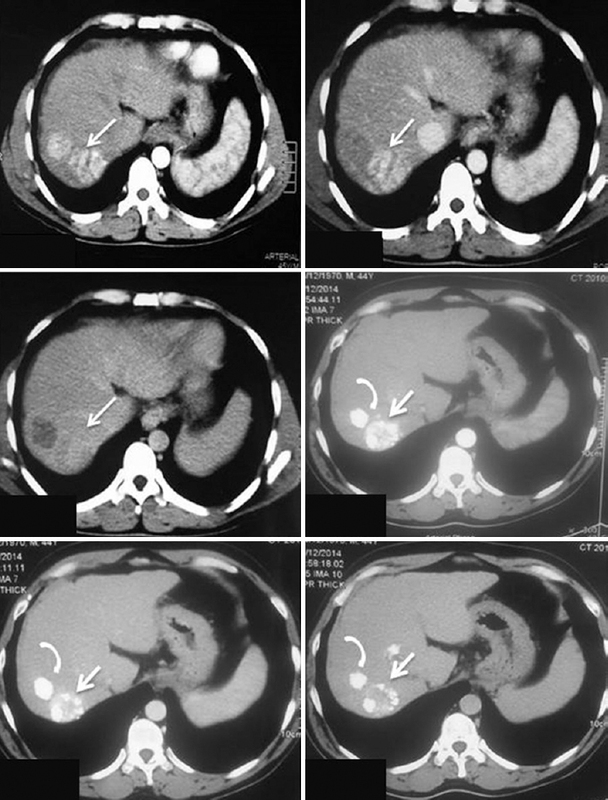 Postembolization triphasic CT findings [Figure 4]d, [Figure 4]e, [Figure 4]f, axial scans, and arterial (d), portal (e) and delayed (f) The CT showed adequate opacification of the lesion by lipiodol (thick arrow). CR with no residual or recurrent activity was evaluated according to mRECIST. Pre-embolization triphasic CT findings, axial scans, and arterial [Figure 5]a and delayed [Figure 5]b phases showed right-lobe (segment VII) well-defined central mass (thin arrow) measuring 7 × 6 cm 2 in diameter. The mass shows typical enhancement, with no enlarged porta hepatis lymph nodes. Postembolization triphasic CT findings, axial scans, arterial [Figure 5]c and delayed [Figure 5]d phases show scanty lipiodol deposition (thick arrow) within the periphery of the lesion denoting stable disease. Maximum intensity projection (MIP) and volume rendering [Figure 5]e show stable disease according to mRECIST. Preembolization triphasic CT findings, axial scans, arterial [Figure 6]a, portal [Figure 6]b, and delayed [Figure 6]c phases at segment VII showed two rounded focal masses. The largest mass (thin arrow) measuring 3.5 cm shows atypical pattern of enhancement whereas the smallest mass measures 2 cm and shows typical pattern. Figure 6: Complete response in smaller lesion and partial response in larger one. Postembolization triphasic CT findings, axial scans, and arterial [Figure 6]d, portal [Figure 6]e, and delayed [Figure 6]f phases show smaller lesion (curved head) with complete opacification by lipiodol. The largest showed lipiodol retention with still areas of heterogeneous contrast enhancement washed out in portovenous and delayed phase (thick arrows). The smaller lesion shows CR whereas the larger one shows PR according to mRECIST. The incidence of HCC has increased dramatically worldwide, making it the sixth most common cancer in the world and the third most frequent cause of cancer death . In Egypt, according to the data of regional oncology centers, there was predominance of liver, breast, and bladder cancer that represented ∼46% of all cancers . HCC is not sensitive to radiotherapy or chemotherapy; therefore, surgery is still the treatment of choice for early stages. Unfortunately, most HCCs are diagnosed at intermediate or advanced stages . Chemoembolization is the most commonly used treatment for HCC that cannot be submitted to surgery. It is based on the objective of tumor devascularization, in which the oxygen and nutrient supply to the tumor is blocked, resulting in tumor necrosis . All of our patients were diagnosed by typical features of HCC based on triphasic CT and elevated serum level of AFP more than 200 ng/dl. 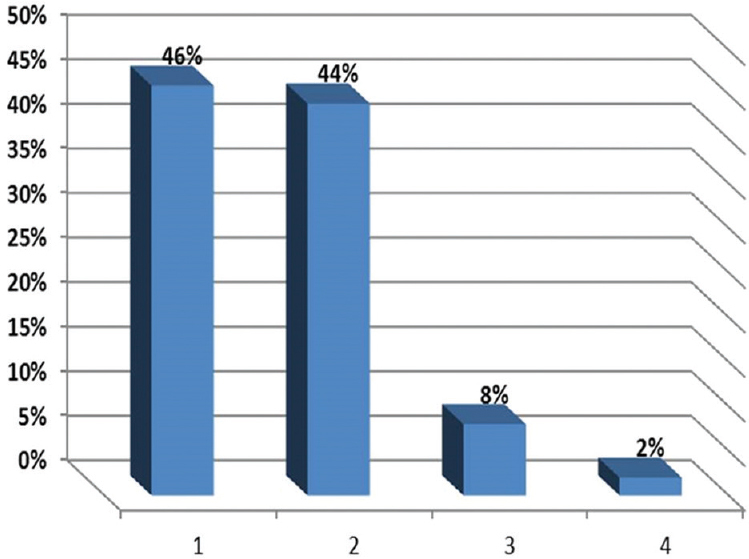 They were 30 (60%) patients presented with Child–Pugh score A and 20 (40%) patients with Child–Pugh score B. Among the treated patients, 45 (90%) patients had HCV-related liver cirrhosis and five (10%) patients had HBV. On the national level, several studies were done on the association between HCV and HCC. Khalifa et al. and Darwish et al. found that among Egyptian patients with HCC, more than 75% were positive for HCV-antibody. Approximate results were reported by Darwish et al. (70%). Abdul Ghafar et al. found that 67.8% of their patients were HCV positive. Fouad et al. concluded that HCV constitutes the main risk factor in Egyptian patients with HCC, and patients with HCV will develop HCC if left untreated and unscreened. In our study, regarding the response outcome of the studied 50 patients, we found that 46% showed CR, 44% showed PR, 8% showed stable disease, and 2% showed PD. Therefore, most lesions were successfully treated with TACE. These data were similar to those of Parkin et al., and they stated that 70% of lesions were successfully treated with TACE. On histopathology, 62 (57%) lesions were 100% necrotic and 14 (13%) lesions were 91–99% necrotic. These tumors together comprised the 'near-complete necrosis' outcome group and represented 70% of all lesions. Conversely, six (6%) lesions were 61–90% necrotic, 10 (9%) lesions were 30–60% necrotic, and 17 (16%) lesions were less than 30% necrotic on histopathology. In comparison with another study done by Bargellini et al., which included 178 patients (males/females = 155/23; mean age 55.8 ± 6.3 years), where patients were classified into responders (CR and PR) and nonresponders (stable and PD), the objective response rate was 78.1% (139/178), with 86 (48.3%) cases showing CR. In comparison with Bruix , where the study included 115 patients who received a first TACE procedure for HCC, roughly half of the patients (n = 59) had a complete or more than 90% HCC tumors showed necrosis after TACE and were categorized as a favorable response. The remaining patients (n = 56) had 60–90 or 30–60% tumor necrosis or stable disease or PD and are categorized as a poor response. These results were also consistent with El Dorry et al. 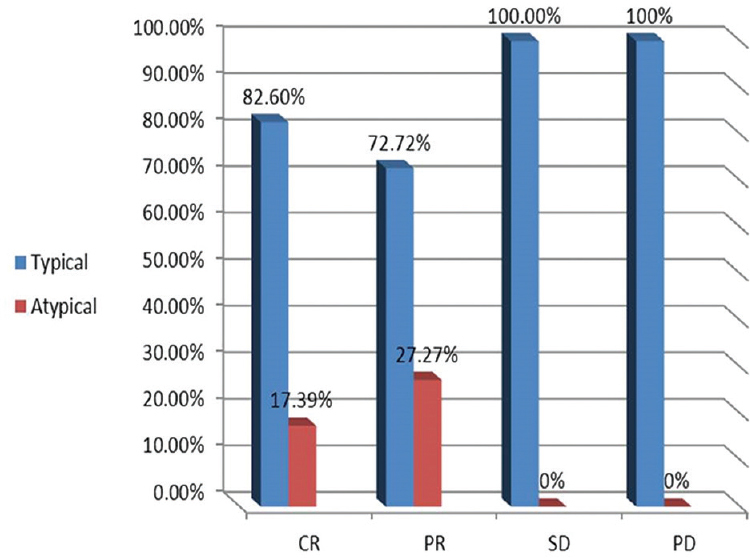 who reported that CR was achieved after 1 month in 84% of patients in TACE. In comparison with Golfieri et al., the reported rates of complete histopathologic tumor response to TACE were 26–83%. This wide range is largely related to heterogeneity in patient population, TACE technique, and definitions of CR. Their study found a rate of near-complete histopathologic necrosis of 70%. This number may be toward the higher end of the reported range for two main reasons. First, their study group included only those patients who were successfully bridged or downstaged to transplantation and thus included tumors with indolent biology or more responsive to treatment. Second, all of our study patients underwent TACE targeting of one or two liver segments. Such selective TACE has been found to result in higher rates of histopathologic necrosis compared with lobar or nonselective TACE. Regarding the response in relation to tumor size in our study, we can state that most of TACE responders were less than 3 cm. This was consistent with Ebied et al., as the smaller tumors were significantly more likely to respond to transcatheter arterial chemotherapy than larger tumors. This was also consistent with Llovet et al. who found that the size of the tumors was smaller in the favorable response group (3.7 ± 1.7 vs. 5.7 ± 3.5, P < 0.001). Similarly, the total tumor diameter also was less in the favorable response group (5.6 ± 2.1 vs. 7.3 ± 4.4, P < 0.0001). In our study, we found significant value of the location of the lesions, where the tumors were labeled central if within 4 cm of the portal vein bifurcation and peripheral if more than 4 cm from portal vein bifurcation, and we found peripherally located HCC lesions give more CR and PR than centrally located lesions, with P value less than 0.004. This is consistent with Llovet et al.who found that peripherally located HCC lesions were more likely to have a favorable response compared with centrally located lesions (P = 0.015). Another study done by Parkin et al. stated that the location of the HCC lesions was classified as 'favorable' or 'unfavorable' based on the authors' experience with selective catheterization of segmental hepatic artery branches supplying a tumor. Lesion location was classified as unfavorable if the lesion was centered in Couinaud segments 1 or 4, or if the lesion border was within 1 cm of the liver dome. Location in segments 1 and 4 was considered unfavorable because tumors in these segments are frequently supplied by small-diameter feeding arteries and therefore selective catheterization and administration of adequate amounts of embolic material is often challenging. Lesions located near the liver dome are sometimes difficult to identify angiographically owing to respiratory motion. All other lesions were classified as favorable in location. In our study, we found significant value of margin of the lesions where well-defined lesions give good response more often than infiltrating lesions. This is consistent with Lopez et al. who concluded that TACE for infiltrating HCC can be associated with significant morbidity and mortality and yielded poor long-term outcomes. Lopez et al. compared patients having unresectable infiltrating versus focal HCCs who were treated with TACE. In this study, patients in both groups underwent TACE using a drug combination of doxorubicin, cisplatin, and mitomycin. A total of 157 TACE treatments were performed in 88 patients with unresectable HCC: 132 treatments in 69 patients with focal HCC and 25 treatments in 19 patients with infiltrating HCC. Patients with infiltrating HCC did significantly worse following TACE. Specifically, after TACE, patients with infiltrating HCC had a longer hospital stay, more procedure-related mortalities, and a higher readmission rate. Triphasic CT is the most commonly used standard imaging technique for predicting and evaluating the therapeutic response in patients with HCC after TACE. The present study may have a bias that the patients were followed up with CT, and not magnetic resonance imaging, and therefore residual or recurrent lesions that could theoretically be masked by lipiodol accumulated within the treated tumors. However, the possibility of missing a residual or recurrent lesion with CT was actually unlikely because these lesions always occurred in areas of partial or complete lipiodol washout, and therefore contrast enhancement would not be masked in the absence of lipiodol. Bruix J, Sherman M. American Association for the Study of Liver Diseases. Management of hepatocellular carcinoma: an update. Hepatology 2011; 53:1020–1022. El-Serag HB, Rudolph KL. Hepatocellular carcinoma epidemiology and molecular carcinogenesis. Gastroenterology 2007; 132:2557–2576. Forner A, Llovet JM, Bruix J. Hepatocellular carcinoma. Lancet 2012; 379:1245–1255. Forner A, Reig ME, de Lope CR, Bruix J. Current strategy for staging and treatment: the BCLC update and future prospects. Semin Liver Dis 2010; 30:61–74. Hu HT, Kim JH, Lee LS, Kim KA, Ko GY, Yoon HK, et al. Chemoembolization for hepatocellular carcinoma: multivariate analysis of predicting factors for tumor response and survival in a 362-patient cohort. J Vasc Interv Radiol 2011; 22:917–923. Maluccio MA, Covey AM, Porat LB. Transcatheter arterial embolization with only particles for the treatment of unresectable hepatocellular carcinoma. J Vasc Interv Radiol 2008; 19:862–869. Meyer BC, Frericks BB, Voges M, Borchert M, Martus P, Justiz J, et al. Visualization of hypervascular liver lesions during TACE: comparison of angiographic C-arm CT and MDCT. Am J Roentgenol 2008; 190:W263–W269. Jemal A, Bray F, Center MM. Global cancer statistics. Carcinogenesis 2011; 61:69–90. Ibrahim S, Lewandowski R, Sato K. Radio embolization for the treatment of unresectable hepatocellular carcinoma: a clinical review. World J Gastroenterol 2014; 14:1664–1669. Kim AY, Choi BI, Kim TK, Han JK, Yun EJ, Lee KY, et al. Hepatocellular carcinoma: power Doppler US with a contrast agent–preliminary results. Radiology 2002; 21:566–569. Geschwind JF, Ramsey DE, Choti MA, Thuluvath PJ, Huncharek MS. Chemo-embolization of hepatocellular carcinoma: results of a metaanalysis. Am J Clin Oncol 2003; 26:344–349. Khalifa A, Mady EA, Abadeer N. Differential tumor markers and hepatitis markers profile in liver tumors. Anticancer Res 1999; 19:2495–2500. Darwish MA, Issa SA, Aziz AM. Hepatitis C and B viruses, and their association with hepatocellular carcinoma in Egypt. J Egypt Public Health Assoc 1993; 68:1–9. Abdul Ghafar Y, Seleem A, Tawfeek M. Percutaneous ethanol injection in large size and multiple lesions of hepatocellular carcinoma. Med J Cairo Univ 2002; 70:299–304. Fouad EA, Kotb HI, El-Kabsh MY, Emara SE. Pharmacokinetics of controlled release morphine (MST) in patients with liver cirrhosis. Br J Anaesth 2004; 79:804–6. Parkin DM, Bray F, Ferlay J, Pisani P. Global cancer statistics. CA Cancer J Clin 2005; 55:74–108. Bargellini I, Bozzi E, Campani D, CarraiP, De Simone P, Pollina L, et al. Modified RECIST to assess tumor response after trans arterial chemoembolization of hepatocellular carcinoma: CT pathologic correlation in 178 liver explants. Eur J Radio 2013; 82:e212–e218. El Dorry AK, Barakat EM, AbdElmoez AT. Combined radiofrequency and chemoembolization vs. chemoembolization in management of hepatocellular carcinoma. Hepatoma Res 2015; 1:19–23. Golfieri R, Cappelli A, Cucchetti A, Piscaglia F, Carpenzano M, Peri E, et al. Efficacy of selective transarterial chemoembolization in obtaining tumor necrosis in small hepatocellular carcinomas. J Hepat 2011; 53:1580–1589. Ebied OM, Michael PF, Brian IC, Karen MP, Wei L, Nikhil A, Albert Z. Evaluation of responses to chemoembolization in patients with unresectable hepatocellular carcinoma. Am Cancer Soc 2003; 97:1042–1050. Llovet JM, Beaugrand M. Hepatocellular carcinoma: present status and future prospects. J Hepatol 2003; 38 (Suppl):I-136–I-149. Lopez RR, Pan SH, Hoffman AL, Ramirez C, Rojter SE, Ramos H, et al. Comparison of transarterial chemoembolization in patients with unresectable, diffuse vs. focal hepatocellular carcinoma. Arch Surg 2002; 137:653–657.